Hey everyone! I picked up my newest ride a few months ago and just now got to posting up here. It's a 2001 with about 12500 miles on it. I live in the DFW area of Texas. I have 3 other motorcylces all in various stages of building; 1976 CB750 cafe, 1981 XS650 bobber and 2001 Spirit 750 street tracker. Work done when I got it: Danmoto Carbon GP, carbon bellypan, Sargent seat, EBC front rotors, flush turn sigs, undertail, integrated LED tail light, sliders, adjustable levers, PAIR removal. I've since done some work on my own: manual CCT's, longer stem mirrors, superbike bars and risers, braided front brake and clutch lines, Danmoto rearsets (will be selling soon, fitting lowered stock pegs), Danmoto baffles, HVMP bar ends, sharkskinz grips covers and a few other things. Work I plan on doing soon: front suspension update, new neck bearings, projector retrofit, aux tail lights, lightened flywheel. I have a question for some of you though. I noticed my engine cases and fork lowers were a magnesium color. Did the previous owner powdercoat/paint these this color, or am I in possession of something special? Pretty un-inlightened to this model as of yet, I just enjoy riding when the heat isn't too bad. Last edited by wannabridin; 06-09-2014 at 12:17 PM. Reason: forgot pictures! You already made some kind of good work with your vtr ! Welcome aboard. Nice ride you have there. And thanks-the 3 other project bikes make me feel a little better about the state of my garage The earlier models had dark charcoal engine cases and silver fork lowers. '01 and up were more of a gold. Ok. So since mine is a 2001, and I've spotted a finned R/R under the seat, am I good to go with that? Or do I need to replace it with a better one? Nice bike you got there. I really like that carbon belly pan. Do you happen to know the maker? Honda did upgrade thier R/R's on the later model VTR's to a unit with cooling fins, however this fined unit is not a MOSFET R/R and will eventually fail. What you need to do, is check to see what R/R you actually have. The previous owner may have replaced it for a MOSFET unit. Check the numbers & letters on the R/R. If the first two letters are "SH", this is a non MOSFET unit, which you will need to replace. +1 on the carbon belly pan!! I'm not sure on the belly pan. One guy said it was a Mori piece, but I'm not sure the identifying marks are hard to make out. Any recommendations on which MOFSET unit to replace it with? Last edited by wannabridin; 06-09-2014 at 09:42 PM. Welcome to the forum. Fellow DFW member here. made some changes. don't have pics of everything yet, but i'll update when i can. Installed all ***** tapered head bearings. Proton flush mounts. I had to hot glue them in for now until I can come up with a better alternative. PO had screwed some lame flush mounts into the plastics, so now there are two small holes I need to fill. Re-did rear tail light. I gutted the integrated turn signal board and installed some led strips that include progressive turn signals and flashing brakes. Refitted stock rear sets w/ stock pegs lowered 1"
Checked TPS. PO had already had this done and I read ~580 Ohms. I left this alone. Changed gauge lights to LED's. LED tag light bolts since the plate is so far under the tail. I'll have some parts up for sale in the near furture if anyone is interested. I'll have to list them later. I'd love to see it some day. We should ride. I go to the Fort Worth Bike Nights (Facebook group) every Friday. wannabridin, would it be possible to see pictures of what you did to your integrated tailight? I have an integrated tailight as well (purchased on eBay), and one night I noticed that the liscense plate wasn't illuminated. I found that the entire circuit board that held the LED's that illuminated the license plate, were completely broken off! The chunks of circuit board and LED's were just bouncing around inside the housing. Damn eBay. Well if you want my board, i'll let you have it for pretty cheap, send me a PM if you're interested. No access to take pics for a few days (work travel), but I bought some run/sequential turn/flashing brake led strips from autozone and stuck them to the housing one above the other. When i stop, it will flash and then hold solid, and then i hit a turn signal, it will do the sequential to each side. Pretty slick and they're BRIGHT! I might add a knight rider bar or two as well to the passenger peg brackets, just because I like having more lights than too little. I appreciate the offer, but I won't be needing your board. I have another integrated light that I can cannibalize parts from. I was just curious what exactly you did. Sounds interesting...except for the Knight Rider lights (just a personal preference). Wannabridin, nice looking hawk you got there. Two questions, I saw you're getting rid of your DM rearsets and was wondering what you wanted for them? Also, do you know which EBC rotors you have on the front there? I'm in need of new rotors and was thinking of going with the EBCs. I really like the look of yours. I believe they're the pro-line contour's (1998 Honda VTR1000 - Super Hawk EBC Pro-Lite Contour XC Brake Rotor | MotoSport). They came on the bike when new. I'll PM you a price for the rearsets. So i should be getting my lightened flywheel in (Erik took off 1.75, so that should make a noticable difference!!). Hopefully I'll get my forks in this week (fingers crossed, but not likely). Got my projector retrofit installed and the headlight sealed back up yesterday, so just need to finish wiring it. got all the dash led's in, and it certainly makes a difference, much cleaner light, i'll take some pics. i still need to finish wiring everything up, but I have the parts now to do a clean job. I have some extra red LED strips that I can't really use on anything else, so I'm considering wiring them up to go inside the belly pan or in the radiator openings, not sure yet. i sure wish i could take some time off work!! 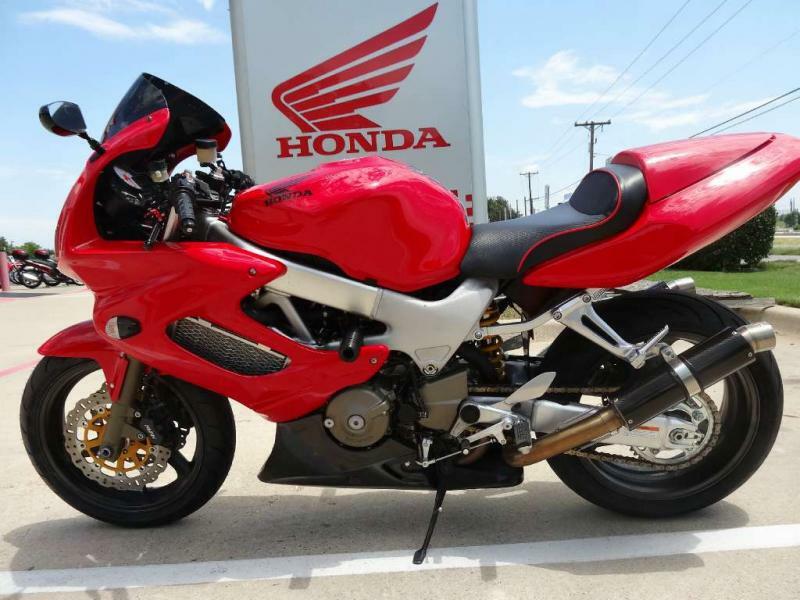 Just ordered some cbr1000 coils on e-bay for a pretty darn good deal. Hopefully they come with the wiring harness from the pictures as well! Post an ad here for the other two stick coils and recoup your money. They sell rather quickly. Ad is up for parts I'd like to get rid of. Also got word that Jamie has shipped my forks, wooo!! One thing I slipped on doing this round was the Factory Pro shift kit. That will have to wait until my next oil change. Then after that, I'll probably do Jamie's shifter. I've read a TON of good things about the shifter! Pretty sure I'm going to go with the "standard" look to the bike. I've never been a big fan of fairings on a bike, so I think one day I'm going to go with the rear mounted radiator, round headlight w/ flyscreen, vfr tank and maybe a few other things. I really want/need some taller bars to ride where I'm most comfortable and I think it would help a lot to have no front fairing to get in my way. Plus I like the way they look as a standard much more! Apex 4 in bars fit well with just a bit of fearing trimming. 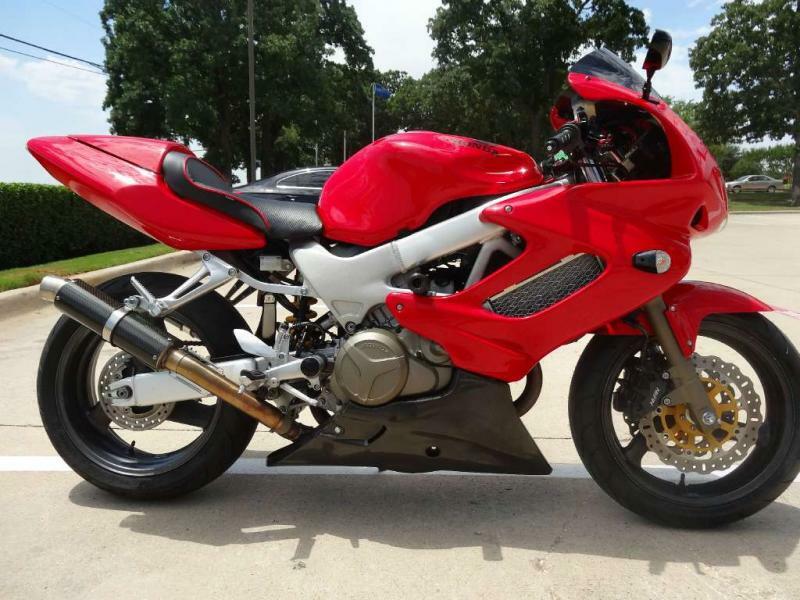 I've since installed another brand new set of fairings, cut them mostly the same and have the bars lowered to 3.5"
I almost bought that bike. you got it from DFW Honda, right? When you decide to go stanard and get rid of that carbon lower I'll take it.